On Friday June 2nd we held our Boys Night & Boot Camp at Richardson's Harley-Davidson. We would like to say a HUGE thanks to all the guys that came along and joined us for the night! Lots of fun was had by all (staff and attendees alike!) check out our album of photos, tag yourself or a mate if you see them! 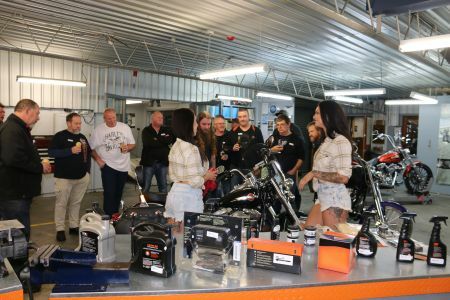 We kicked off the night with a run down on the available Harley-Davidson models, and customisation available in the Genuine H-D Parts & Accessories range, followed by a workshop and service tour, along with a dyno demo on our dyno mahcine. PLUS the guys from Micra Accident Repair Showed us some wicked paint work. The Team at Tasmanian Motorcycle Warehouse gave an intro into their bikes and showed the guys how to pick up a dropped motorcycle. The team at Richardson's H-D would like to thank our suppliers and awesome reps Megan at Piranha Eyewear and Wil from Draggin Jeans Australia for supplying us with some great prize packs for our Lucky Door Prize and Show N' Shine' winners. Show N' Shine winner Was Al who took home a $100 Draggin Jeans voucher. The guys had a chance to get a fresh cut by Steve and Zach from Launceston Barbers, along with Magic from FriedRice Magic. Richardson's Harley-Davidson and Buell! We would like to say a HUGE thanks to all the guys that came along and joined us for the night! Lots of fun was had by all (staff and attendees alike!) check out our album of photos, tag yourself or a mate if you see them! We kicked off the night with a run down on the available Harley-Davidson models, and customisation available in the Genuine H-D Parts & Accessories range, followed by a workshop and service tour. PLUS the guys had the opportunity to get on our Jump Start machine with the ALL NEW Street Rod 750A demo model, and Warren & Nicki showed the guys how to pick up a dropped motorcycle. The team at Richardson's Hobart would like to thank our suppliers and awesome reps Megan at Piranha Eyewear and Wil from Draggin Jeans Australia for supplying us with some great prize packs for our Lucky Door Prize and Show N' Shine' winners. Lucky Door Prize winners Garry took home an Ugly Fish Prize pack & Johannes won a Draggin' Jeans voucher. The guys had a chance to get a fresh cut by Tegan from Nywele Hair Hobart while they kicked back with a beer and some pizza. Stakes were high and the scores were close in our Darts Competition, with Nat coming first with his score of 71, winning a H-D Dartboard! Cheers to all to joined us!